Please see below important information from the Harbour Master of Pilbara Ports Authority in regards to Port Hedland – Severe Tropical Cyclone VERONICA - Alert Stage 4 - SHUT DOWN - update 4. The PPA – Port of Port Hedland cyclone response procedure has been activated. The Port of Port Hedland is now at Cyclone alert Stage 4 – Shut Down. As of 1500 AWST Friday 22 March, the BoM has issued guidance forecast for Severe Tropical Cyclone Veronica (Category 4) currently located 190 NM North - North West of Port Hedland. Severe Tropical Cyclone Veronica is expected to maintain its intensity and move towards the Pilbara coastline over the next 48 hours. The Port of Port Hedland was CLOSED at 1230 AWST today 22 March. The inner harbour and shipping channel was cleared of all large commercial vessels as of 1230 AWST today 22 March. The anchorages were cleared of all vessels as of 1338 AWST 21 March. Small vessel operators are continuing to secure their assets within the various facilities located in the inner harbour, this is expected to be completed as of 1800 today. On water inspections within the inner harbour post the departure of large commercial vessels has been completed. PPA Port Hedland will continue to be guided by the weather forecasts issued by the BoM and the community alert system over the coming days. A further update when the Port of Port Hedland is in a position to commence operations. The latest track map as of 1500 AWST 22 March for Severe Tropical Cyclone Veronica is attached below for your reference. Please see below important information from the Harbour Master of Pilbara Ports Authority in regards to Port of Dampier– Cyclone Stage 4 - Severe Tropical Cyclone Veronica – Update 6. 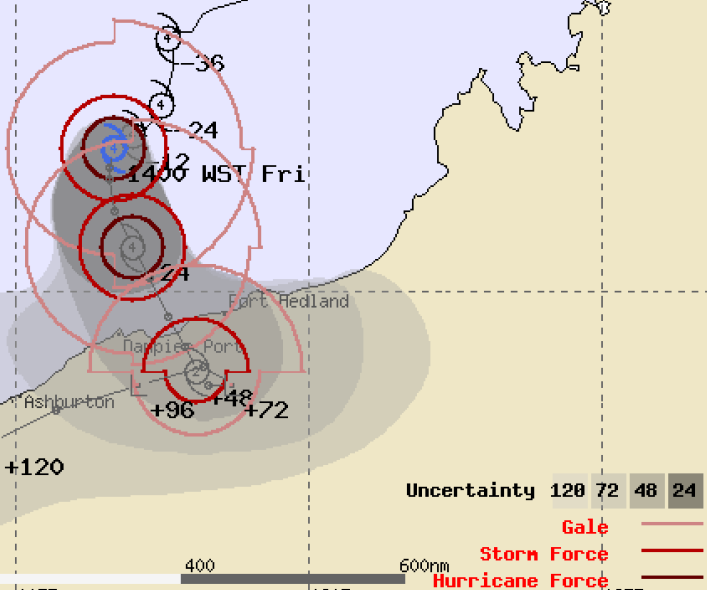 As per latest BoM forecast the severe tropical cyclone Veronica (Cat 4 system), is currently located North of Dampier. This severe tropical cyclone should initially track southwest today, before taking a more south to south easterly direction on Saturday as it approaches the Pilbara coast in next 48 hours. This Severe Tropical Cyclone is forecasted to bring heavy rainfall, high swell, storm surges and winds in excess of 100 knots to the Port of Dampier. Dampier & Ashburton VTS will be unmanned from 1800 LT on 22nd March 2019. The weather forecasts will continue to be monitored with further advice to be issued when a decision is made to activate “Stage 5 – Re-Open the Port”.